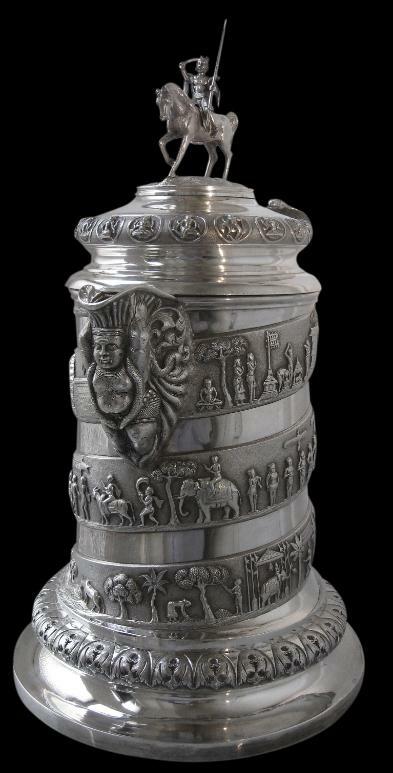 This is the largest, most monumental example of Indian colonial silverware that we have encountered, and is perhaps one of the most extraordinary items of colonial ‘Raj’ silverware ever made. 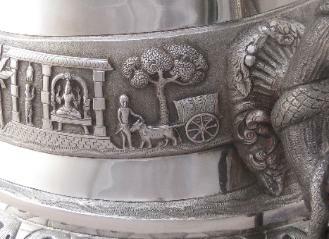 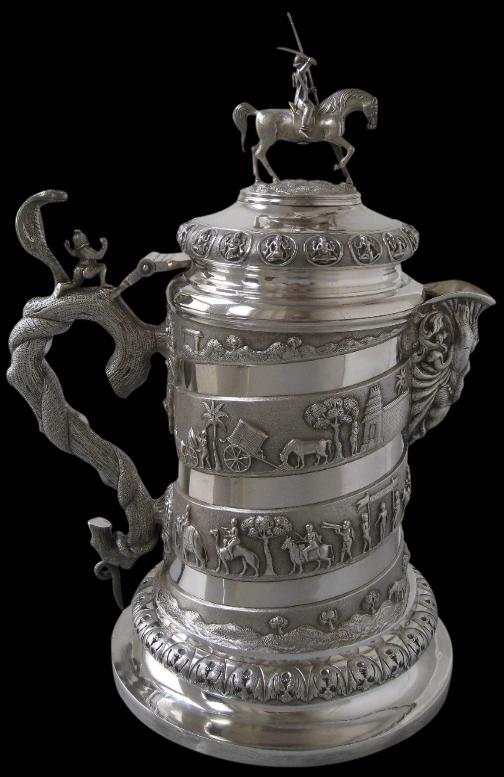 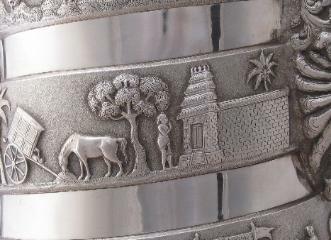 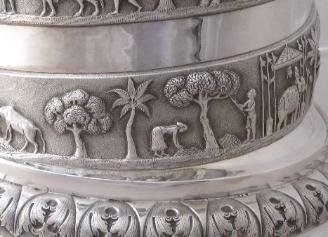 It is by any measure an extraordinary piece, modelled on the types of English silverplate that were displayed on the large oak sideboards of aristocratic English country houses and in the great dining halls of military colleges and guild halls, but superbly decorated in a manner exemplary of the colonial south Indian silverware of the time. 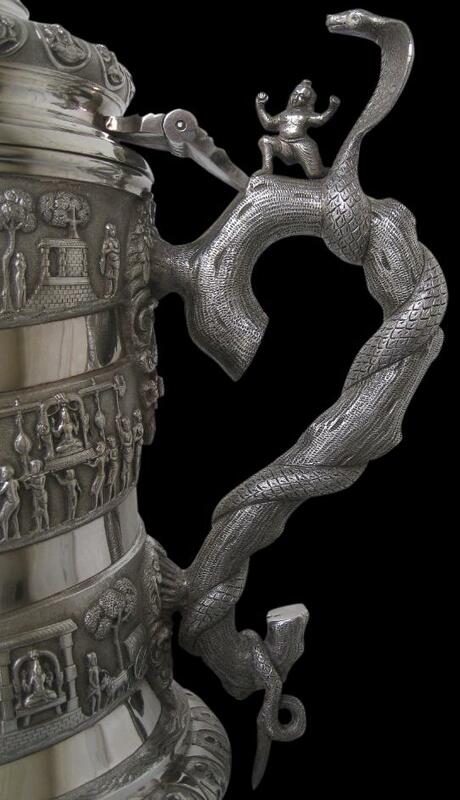 It is made of solid, high-grade silver; its walls are of unusually thick-gauge silver giving the piece at almost 4 kilograms, a weight that matches its monumental appearance. 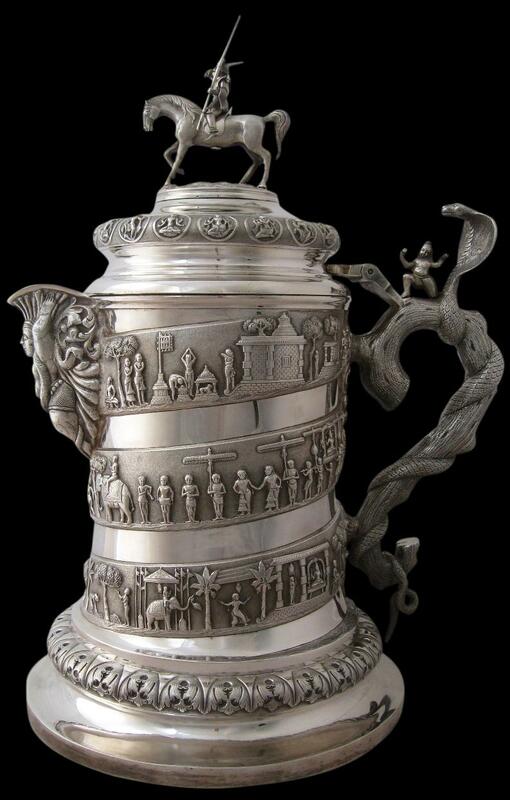 The form is of a over-sized tankard but far more massive than any tankard could conceivably be. 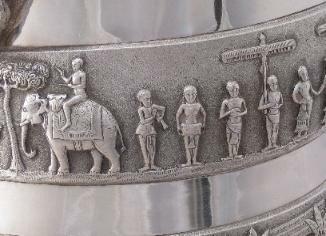 The interior has a gold wash and the spout is fitted with a strainer, although the holes are too large to make this item suitable for tea. 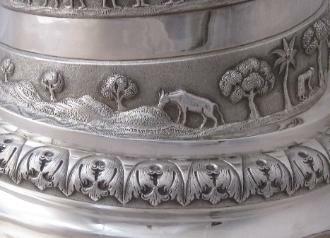 Instead, it was most probably intended to hold iced water, perhaps part of a particularly opulent dinner service. 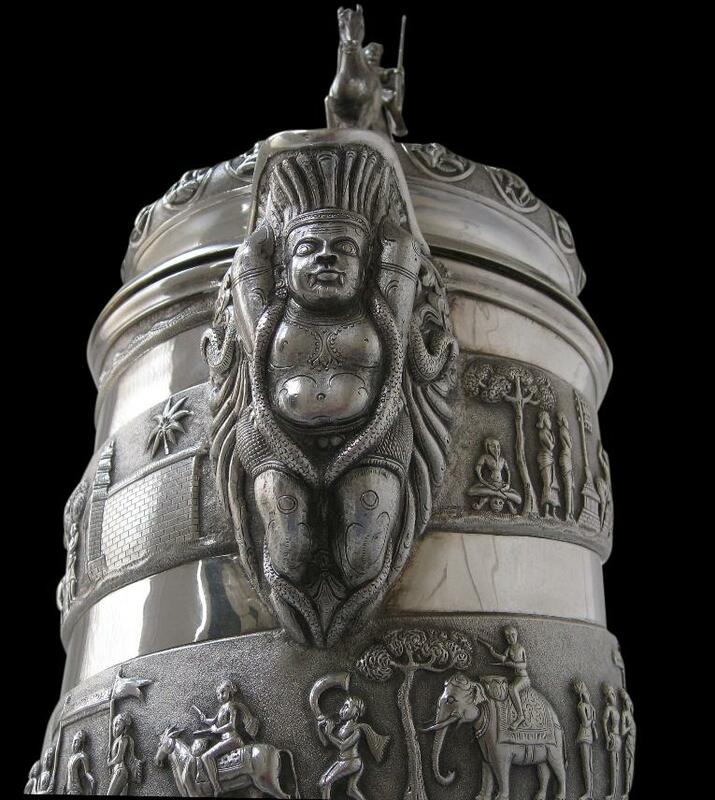 The hinged lid is surmounted by a solid cast horse and mounted Indian warrior, the form of which most probably is based on the massive marble sculptures of warriors and warrior horses found at the thirteenth century Konarak temple complex in Orissa. 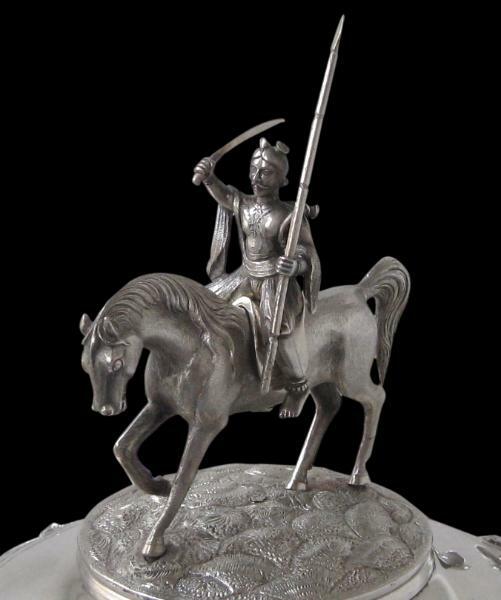 The warrior brandishes a sword and a spear and wears a dagger and a shield. 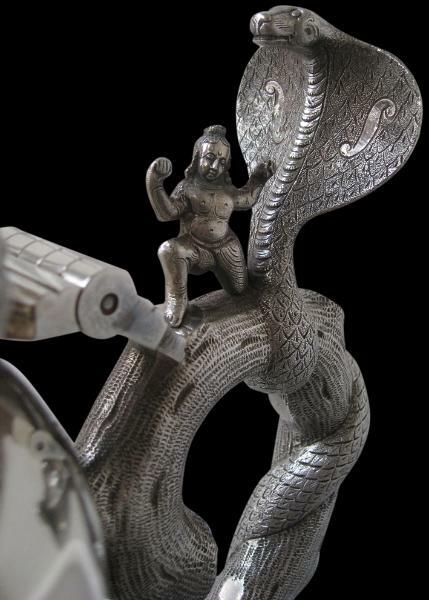 His face has been finely-cast with a magnificent moustache. 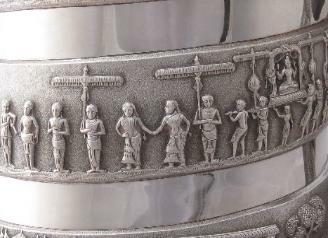 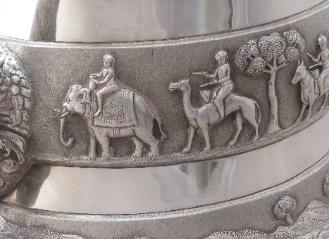 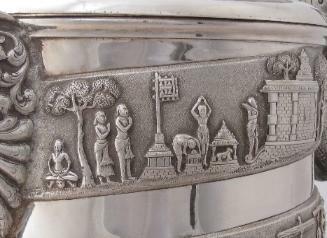 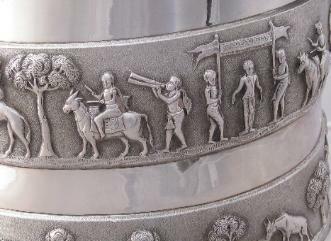 The lid is further decorated with no less than eighteen roundels each containing a swami figure. 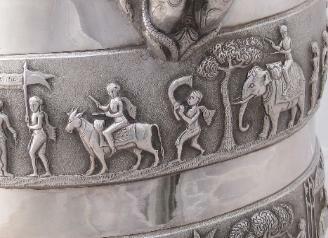 The body of the vessel is decorated with a single panel or frieze that is 62 centimetres long which spirals its way up the vessel, creating a ribbon effect against the plain, unembellished background. 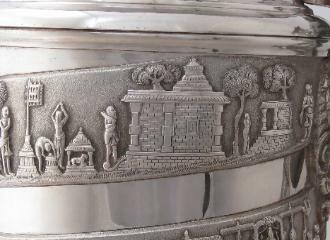 The frieze shows a lengthy Indian temple procession and incorporates no less than 54 chased figures of deities, humans – worshippers, mahouts, and musicians – and animals including elephants, camels and horses, as well as trees, temples and canopies. 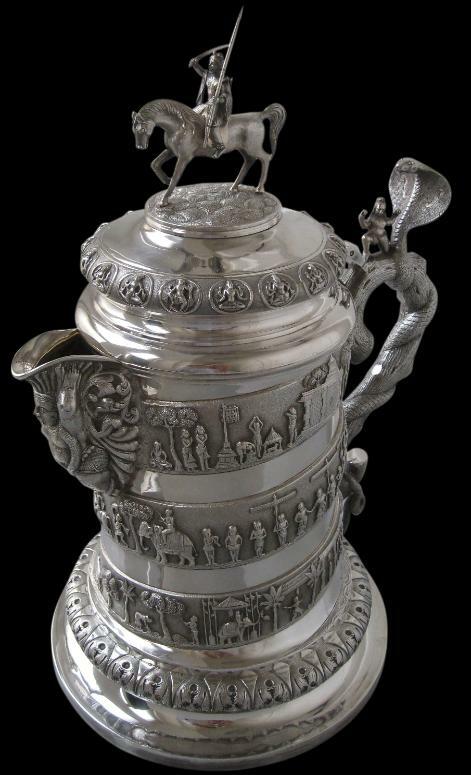 tour-de-force of colonial Indian silver smithing. 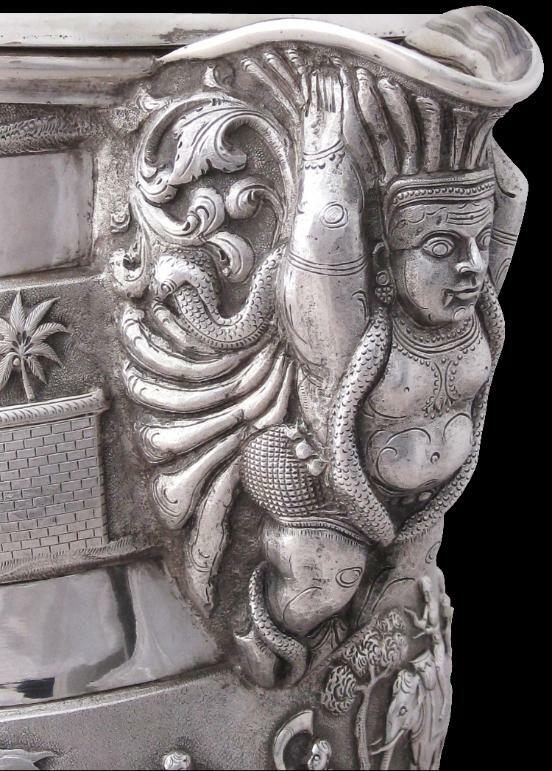 The vessel sits on a wide, heavy foot surmounted by a thick band of exceptionally well-formed acanthus leaves in high relief. 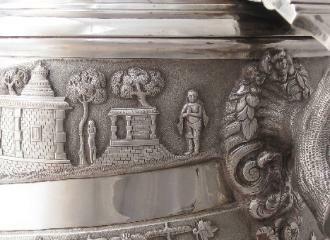 The underside of the base is stamped ‘P Orr & Sons/Madras’. 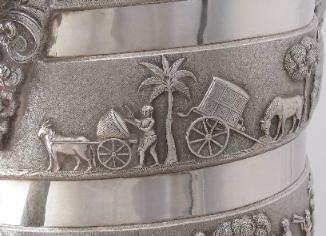 The firm was founded by Peter Orr, an expatriate watchmaker from Edinburgh, around 1848 and later operated from premises in Mount Street, Madras. 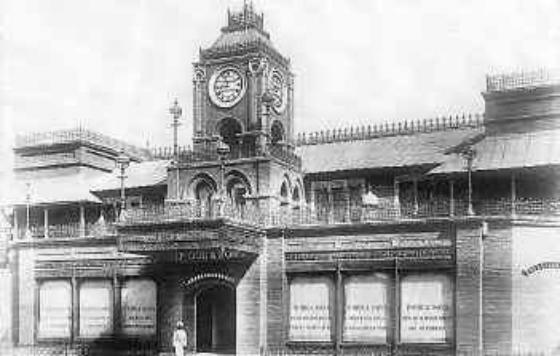 It became known as P Orr & Sons in 1863. 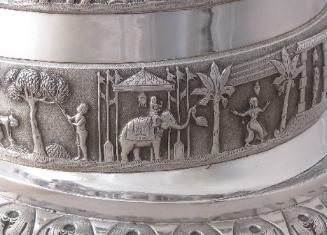 The firm made its reputation when three maharajas – the Gaekwar of Baroda, the Maharaja of Cohin and the Maharaja Holkar – commissioned from it various gifts that were presented to the Prince of Wales during his visit to India in 1875-76. 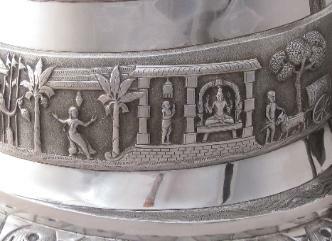 P Orr & Sons specialised in what became known as ‘swami ware’ – ‘swami’ because of the decorative themes based on Hindu deities and the associated festival processions. 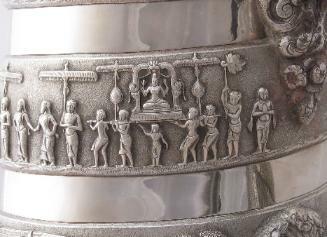 Overall, this piece is an exceptional piece highly suitable for an important private collection or public museum or art gallery. Watt, G., Indian Art at Delhi 1903, Being the Official Catalogue of the Delhi Exhibition, 1902-1903, Superintendent of Government Printing, India, 1903; Dehejia, V., Delight in Design: Indian Silver for the Raj, Mapin, 2008; Wilkinson, W.R.T, Indian Colonial Silver: European Silversmiths in India (1790-1860) and their Marks, Argent Press, 1973; and Wilkinson, W.R.T., Indian Silver 1858-1947, 1999.